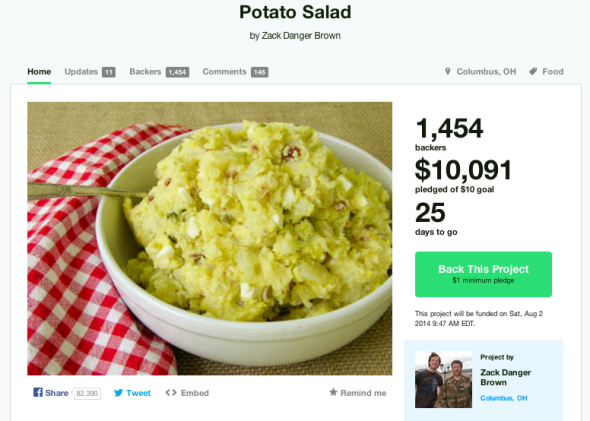 Potato salad on Kickstarter: The project has raised more than $40,000. Now, as of the writing of this post, the potato salad project has raised more than $10,000, thanks to more than 1,400 backers. The page has been shared on Facebook more than 77,000 times. My kitchen is too small! I will rent out a party hall and invite the whole internet to the potato salad party (only $10 and above will be allowed in the kitchen)! The internet loves potato salad! Let’s show them that potato salad loves the internet!! I’m hoping that “Let’s show them that potato salad loves the internet” is actually code for “I’m going to prepare some potato salad then donate most of these extra proceeds to a local food bank, so that people who don’t have money to throw at gag Kickstarters can enjoy a meal.” That will make the joke even better! Update, July 7, 2014, 5 p.m.: Since we posted this article, Brown’s potato salad project has raised a total of more than $23,000. Update, July 8, 2014, 1 p.m.: Since we posted the above update, Brown’s potato salad project has raised a total of more than $40,000.